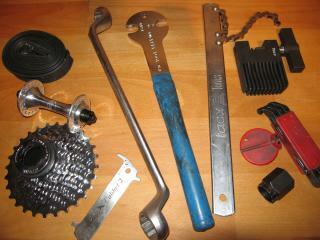 I often get asked about bicycle maintenance and repairs, and tips for how to ride efficiently. This little manual is intended as a summary of what I have learned over the years. I am not a professional mechanic. All of what I say here is the result of personal experience and opinion and may in places flatly contradict professional techniques, but it has served me well. I offer no guarantees that it will work for you. If your bicycle falls apart because I said something wrong, you are on your own.